Hi everyone! I hope you all had a good week! Yesterday, a dam at an iron-ore mine in Brazil collapsed. Because of this disaster, I thought I would research a bat from Brazil. I found a very cute bat! It looks like a shrew that knows something you don’t. It’s called the Greater sac-winged bat. In addition to Brazil, these bats live in several other Central and South American countries. Their range is from central Mexico, through Central America, into South America. They live in the South American countries of Brazil, Bolivia, Guyana, Suriname, Guyane, and the Antillean islands. 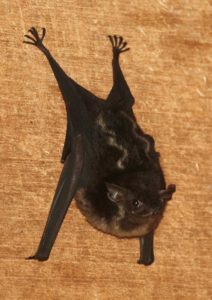 The Greater sac-winged bat has dark brown fur, and some have zig-zag stripes on their back. They have long noses and upper lips that are very mobile. They get their name from the small sacs or pouches on their wings. While grooming themselves, the males fill their sacs with drops of urine and glandular secretions. When they are trying to attract a female, the male will hover over her and flap the scent in their sacs toward her. They will also use this technique to ward off other bats from outside their territory. Another interesting fact about these bats is that their pups babble. They will vocalize calls and other sounds, but jumbled up just like a human baby’s babbles. This is the first mammal that is not a primate to be seen babbling. If you’d like to read more about the Greater sac-winged bat, you can find information here.